I celebrated my 23rd birthday this past Monday and I’m feeling extremely old. Instead of doing the usual what-am-I-doing-with-my-life and over analyzing everything, I took a more appreciative approach. I remembered how grateful I should be for everything I have, and reminded myself of all that I’ve accomplished this past year. I was also reminded of what amazing friends I have, when my birthday plans didn’t exactly go as I had hoped. My family was also great – taking me out for all the Italian food I could eat (my favorite)! 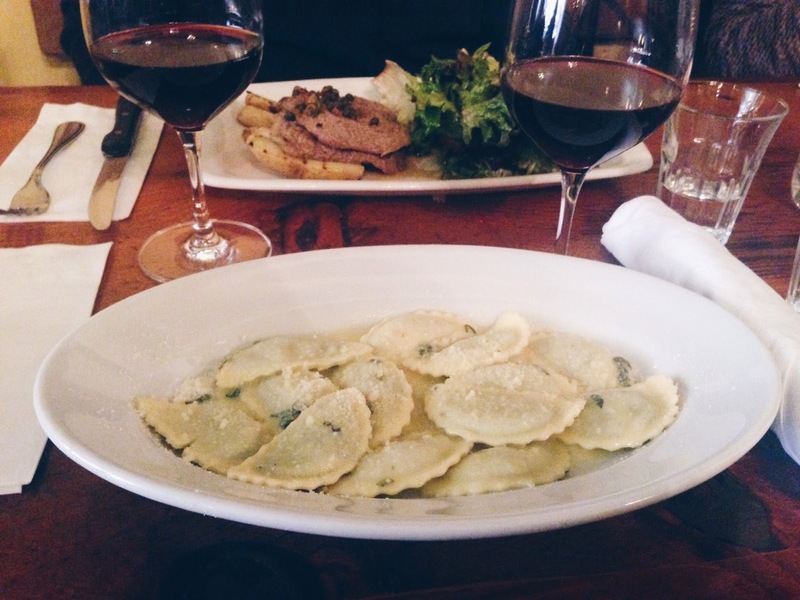 I’m always on the hunt for good Italian food, and will eat it whenever I can. I fell in love with the food and culture even moreso when I was in Italy a few years ago. 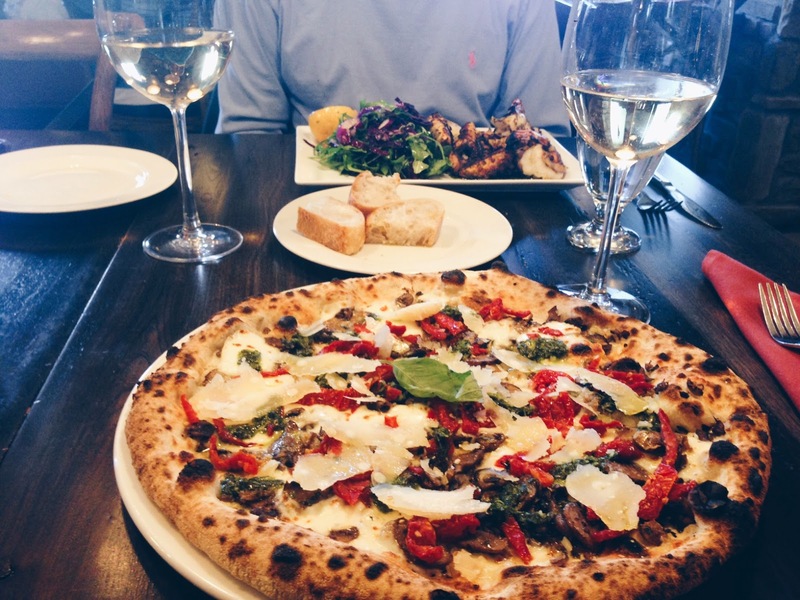 We went to a couple of restaurants over the weekend, Terroni in Toronto, and Goodfellas in Mississauga. At Terroni, I had Agnolotti alla Lilli, which is ravioli stuffed with spinach, ricotta and pecorino, and topped with sage and parmigiano. The next day I devoured a wood oven pizza (kidding .. I could barely finish 3 pieces) from Goodfellas, called il Bosco. It had a pesto spread, sauteed mushrooms, sun-dried tomatoes, and mozzarella cheese. I was still eating leftovers a couple days later .. seriously, I can’t get enough. I’m truly grateful to my family and friends who made my birthday weekend feel really special! These rice paper wraps are really easy to make. Perfect for school, work, or a quick snack! You can put just about anything in them, but today I decided to use minced chicken, lettuce, veggies, and some teriyaki sauce. your ingredients and roll like a burrito. Enjoy! Canadian Winters. It’s -25°C outside – and so cold that your face burns the moment you step out the door. Eventually we all need to venture outside and brace the cold. What’s a girl to do? Here’s 5 tips to help you stay warm during the cold months, and look good doing it! Buy a good ankle bootie. Good ankle booties can get you through an entire winter season. These ones are from Steve Madden (similar here), and are about 3 years old – that’s right, they’ve lasted this long. And I wear them a ton during winter. Add a pair of thick, chunky socks to keep your feet and ankles warm. This might seem like an obvious thing, but I have to say it. Layer! I always try to have at least 2 layers on, if not 3. I started with a black tee, added a plaid button up and finished with a long grey cardigan from American Apparel (similar here). always try to wear a hat or keep my hair down so my ears can stay warm. from one place to the next, and my steering wheel can get really cold on those -25 days. I bought a pair of leather gloves from Danier so my hands wouldn’t freeze (similar here), which were on sale – bonus! They also help quite a bit when you need to clean off all the snow from your car. Another great investment. This one, from Aritzia goes with just about everything, and keeps you insanely warm on those frigid days. Throw it over your shoulders to complete the outfit and you’re ready to brace the cold! Valentine’s day has come and gone, but this DIY is good for any special occasion. My sister wanted a personal and inexpensive gift to give to her boyfriend for Valentine’s Day, and I helped her decide on these Open When cards. The idea is really simple. Create cards for various moods your significant other may face, and write what you would say to them in that particular situation. For example, I helped my sister make cards to open when here boyfriend was happy, sad, when they were fighting, when he wanted to laugh, etc. It’s an easy, do-it-yourself gift, that can be given to any loved one. Take a beak from the roses, chocolate and gift cards and give them something personal that they’ll truly appreciate!